Red Wine, Green Tea and Dark Chocolate: Over 5,000 Children's Products Contain Toxic Chemicals Linked to Cancer and Hormone Disruption. 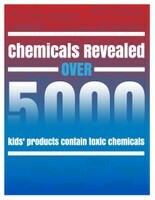 Over 5,000 Children's Products Contain Toxic Chemicals Linked to Cancer and Hormone Disruption. Over 5000 children's products contain toxic chemicals linked to cancer, hormone disruption and reproductive problems, including the toxic metals, cadmium, mercury and antimony, as well as phthalates and solvents. A new report by the Washington Toxics Coalition and Safer States reveals the results of manufacturer reporting to the Washington State Department of Ecology. Read the whole report here.